BNL’s Brayton Bailey and the Stars (11-8) will host Class 3A No.9 Brownstown on Friday night. BEDFORD – Bedford North Lawrence will face the best six-foot-and-under team in the state on Friday night as it starts a three-game homestead to conclude the regular season. Size doesn’t matter to Brownstown, one of the top Class 3A programs in Southern Indiana. The Braves (14-3 and ranked No.9) don’t have a starter listed over 6-1 (and basketball players have been known to stretch or exaggerate heights), but they’re big enough to cause major headaches. Brownstown can take down anybody. Ask 3A No.6 Silver Creek, which suffered a 41-40 defeat to the Braves. Ask Seymour and Jennings County. Ask anyone in the Mid-Southern Conference. The Braves are currently 8-0 in that competitive league. And the last time Brownstown bounced into BNL Fieldhouse, it made history with its first road victory in the series. Fearlessness doesn’t care about environment or challenges. 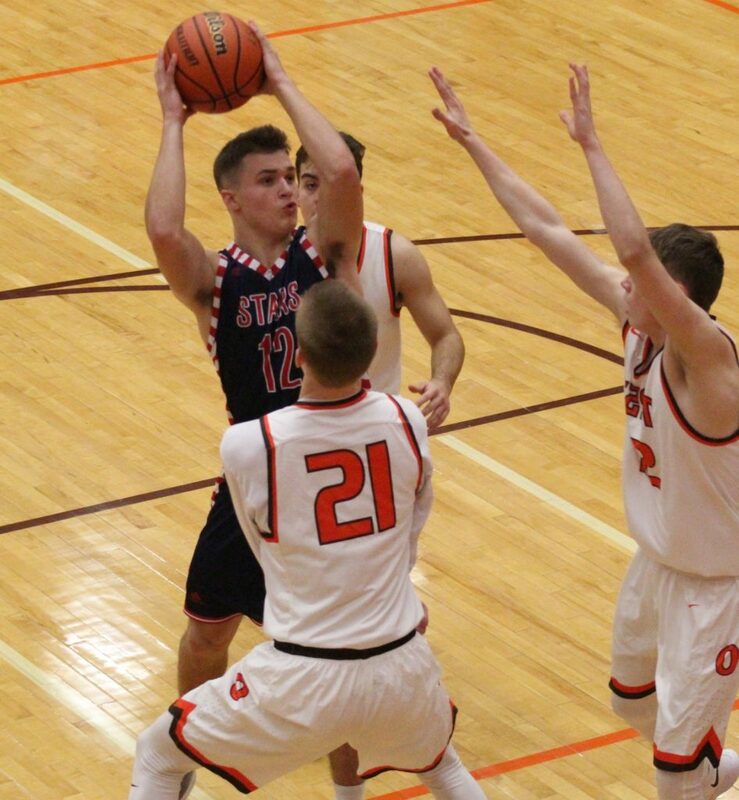 Brownstown will feature a senior-laden lineup that includes scoring leaders Isaac Johnson (12.5), Michael Boshears (11.0) and Seth Borden (9.1). BNL definitely remembers Boshears, who exploded for 32 points during last year’s shootout at Brownstown. The Stars won that 71-66, escaping with scorch marks. BNL’s McCall Ray had 22 points last season against Brownstown. “Boshears is very talented,” Seifers said. “He can shoot from anywhere and score, create his own shot. I don’t know if we can guard him. We couldn’t last year. He dominated the game and I don’t know he has to do that this year. BNL did exactly that during the second half of its last outing as the Stars stopped Edgewood 70-54. Both teams have won seven of their last eight starts as they prepare for this clash. Brownstown has always been about defense. The Braves are allowing only 45.1 points per game (31st in the state), so it’s the other end that serves as the team barometer. Boshears shot holes in the Stars last year, scoring 17 first-quarter points, including a 4-point play, as the Braves smoked to a 20-13 lead. BNL erased that flurry with a 11-0 run to end the period and held off the Braves with its own perimeter attack. McCall Ray paced the Stars with 22 points, including 5 treys, while Brayton Bailey added 14. This series, which has some classic confrontations in its history, was idle from 1998 until 2014. 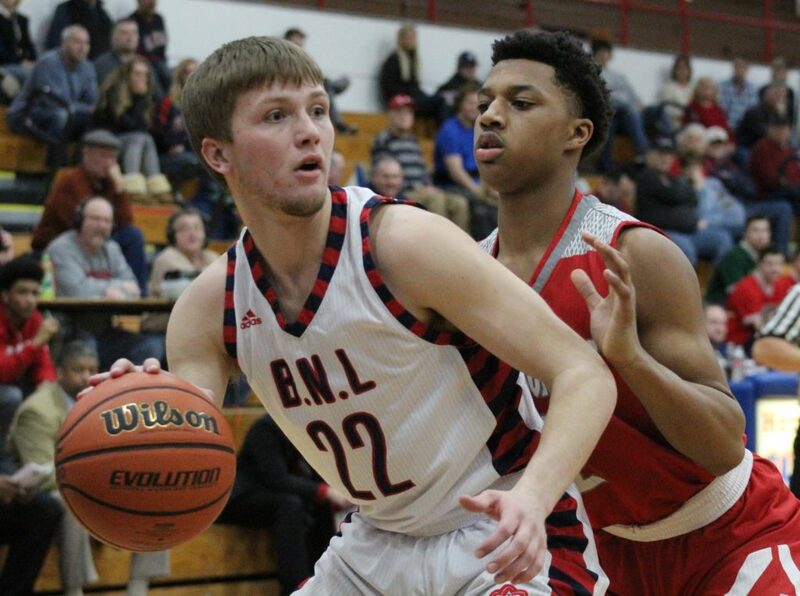 BNL won the renewal, but the Braves took the next two, including the 76-57 beatdown at BNL. The Stars, who played 8 of their first 10 games away from home and just finished a three-game road trip, are glad to be back inside comfortable surroundings. The game will be live streamed on the website. Last meeting: Last year at Brownstown, the Stars edged the Braves 71-66. McCall Ray had 22 points (including 5 3-pointers) and Brayton Bailey added 14 for the Stars. Michael Boshears had 32 points for Brownstown. Game notes: Brownstown coach Dave Benter is 28th on the state list of active coaches with 374 career wins. His winning percentage (74.5) is the highest among any coach in the top 33 on that list. F – Seth Borden 6-1 Sr.
F – Ethan Wischmeier 6-1 Sr.
G – Isaac Johnson 6-1 Sr.
G – Michael Boshears 5-10 Sr.
G – Braden Neal 5-9 Sr.
G – Brayton Bailey 6-2 Sr.